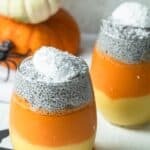 This candy corn parfait is a festive, healthy and fun treat to have for Halloween. It's made with fruit, coconut milk and chia pudding - vegan and easy! Halloween is on Wednesday! And there is candy corn everywhere in grocery stories! I love being inspired by the season, but I try to limit the artificial colors and heavy sugars for my kids. I think there’s a time and place for candy corn and Halloween candy. But I like to use is for inspiration to create something festive, healthy and totally adorable! 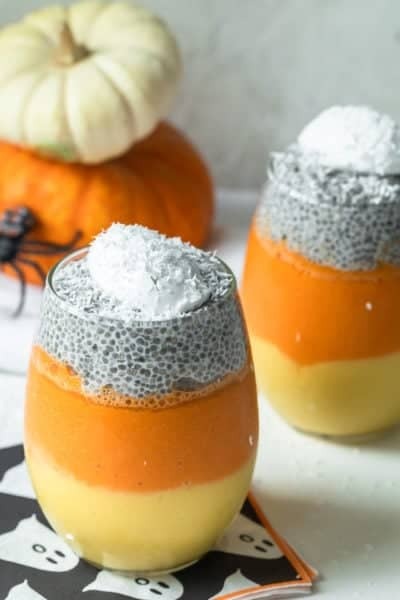 That’s why I created this Candy Corn Parfait – It’s like a smoothie bowl topped with chia pudding. Even though the chia pudding is on the top, I start with that lyer. To make that, follow my chia pudding recipe here. It’s basically 1 part chia seeds to 4 parts liquid and any sweetener you want. It’s important to make the chia pudding first, because you’ll want that to set in the fridge in a jar for at least 30 minutes or ideally a few hours. For the yellow layer, I simply use frozen mangos with coconut milk. When you blend it you’ll want to have a slushy-like consistency. This has to be the thickest layer of the candy corn parfait to hold up the other two layers. This will help make sure the layers don’t bleed into each other, like a normal smoothe would. Then I slowly pour and divide into two huge cups, or 4-6 smaller jars. Next is the orange layer of the candy corn parfait. For that I use again frozen mangoes with coconut milk, but I also add carrots. The carrots give it that dark orange color and a nice vegetable serving. 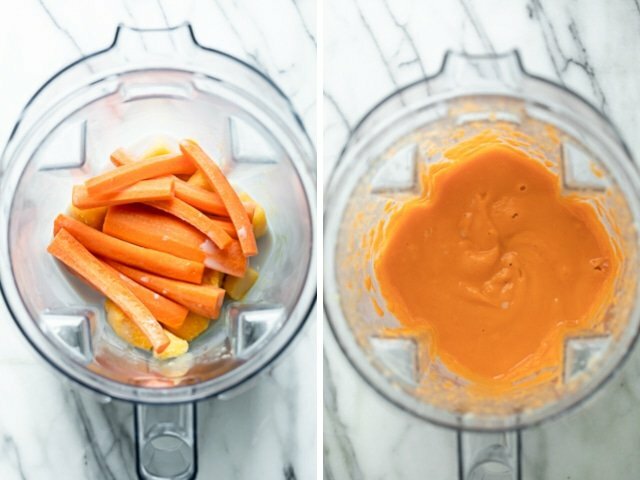 You can grate the carrot before blending if you don’t have a high speed blender. For this layer, you can also add maple syrup to sweeten it, but it’s totally optional. Once the orange layer is done, pour that on top of the yellow layered cups. Then scoop on the chia pudding on top and you’ve got a festive smoothie-like candy corn inspired parfait/pudding. Limit the liquids: You just need enough coconut milk to help the motor of the blender start running. If you don’t like coconut milk, you can use any kind of milk or even water. A little bit goes a long way in creating the perfect consistency. Work with frozen ingredients: It will make all the difference. Since carrots are solid though, they don’t need to be frozen, but it wouldn’t hurt. Make the chia pudding in advance: Chia pudding is best when it sits for at least 30 minute or ideally a couple hours. This will ensure it’s actually pudding-like and not watery. Freeze between layers: Even though the layers are pretty solid, it helps to layer the yellow and place it in the freezer while making the orange layer. Even 5 minutes in the freezer will really help it. Pour slowly: If you pour it too quickly, the layers may bleed into each other, so make sure to carefully pour one layer on top of another. If you’ve tried this healthy-ish feel good Candy Corn recipe or any other recipe on FeelGoodFoodie, then don’t forget to rate the recipe and leave me a comment below! I would love to hear about your experience making it. And if you snapped some shots of it, share it with me on Instagram so I can repost on my stories! For more vegan snacks, try these recipes! Pour the chia seeds and the milk into a jar and stir well with a fork. Let settle for 2-3 minutes then stir again very well until you see no clumping. Cover the jar and store in fridge overnight or for at least 30 minutes. To prepare the first yellow layer, blend the mango chunks with the coconut milk until the mixture is thick like a slushy. Divide into two cups and place the cups in the freezer while preparing the next layer. 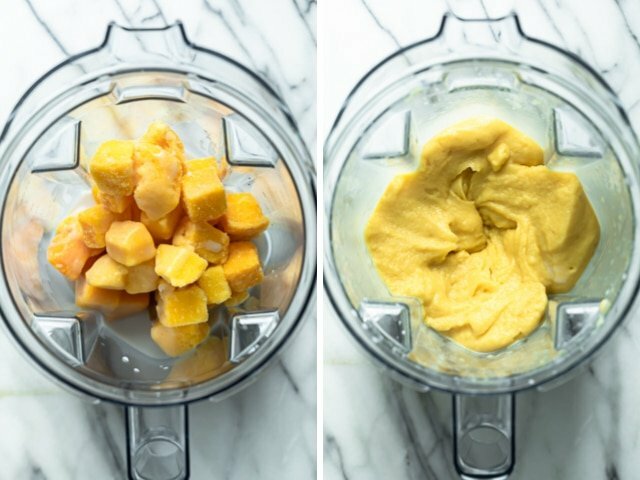 To prepare the orange middle layer, blend the mango chunks with the carrots and coconut milk until the mixture is thick like a slushy. Divide carefully on top of the yellow mixture in the cups. 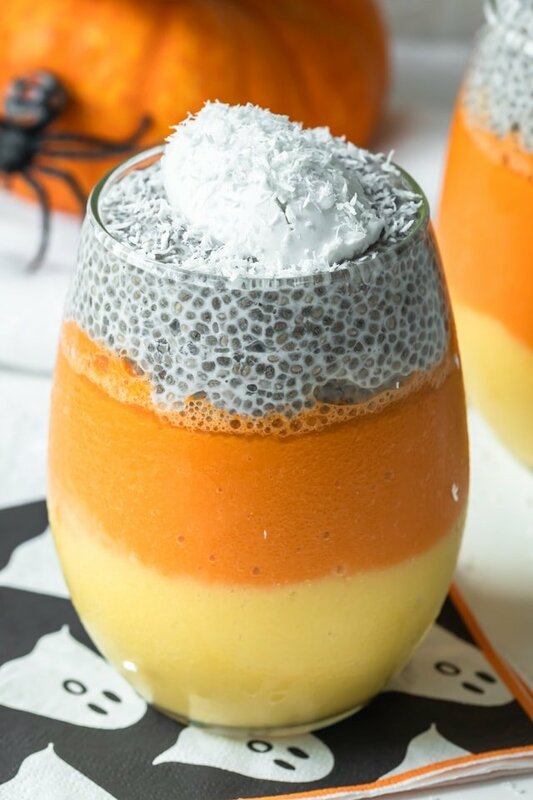 Pour the chia pudding over the orange part, top with whipped coconut cream and enjoy! Storage: Store any leftovers in an airtight container. This will last about 3-4 days in the fridge. Make Ahead: You can make the chia pudding up to 3-4 days ahead of time and store it in the fridge. Substitutes: For best results, follow the recipe as is. You can get creative with the orange and yellow layers by using different fruits and vegetables. Nutrition: Please note that the nutrition label does not include the whipped cream on top. Also the servings are for 4 people even though the image shows the servings in two cups. Always looking for your tips. Frozen mangoes with coconut milk for consistency.